NitroTech is scientifically engineered whey protein powder designed for anyone looking to build more muscle, improve their strength and enhance overall performance. NitroTech contains pure whey protein peptides and isolate as the primary source. 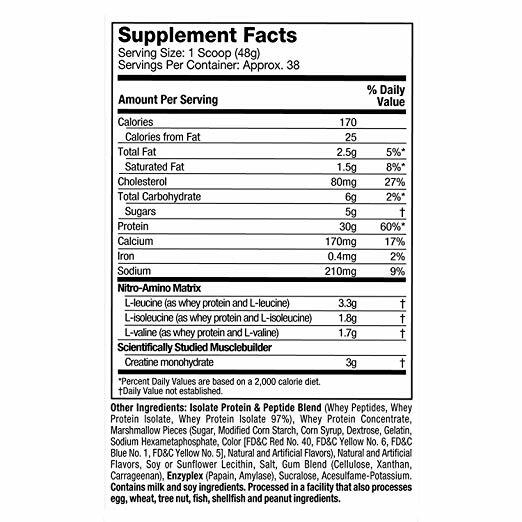 Every scoop provides 30 grams of ultra-pure whey protein and 6.8 grams of Branched Chain Amino Acids (BCAAs) along with a strength-enhancing 3 gram dose of creatine. To ensure a high standard of quality and purity, the whey protein in NitroTech has been filtered using multi-phase filtration technology.